and the botched restoration by Cecilia Gímenez, right. 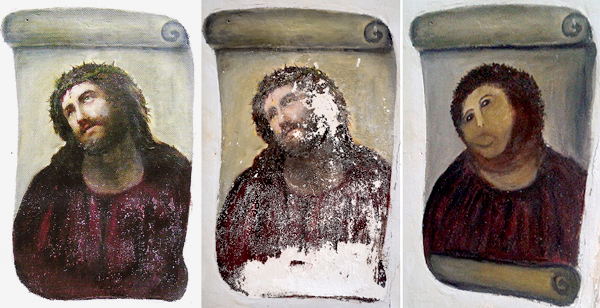 The story isn't news anymore; pretty much everyone has heard about the Spanish fresco, Ecce Homo (Behold the Man), which was ruined when amateur artist Cecilia Gímenez tried to restore it, without the knowledge or consent of the church. The story went viral about five months ago, appearing on comedy shows and even inspiring some Halloween costumes. The fresco has been jokingly referred to as Ecce Mono (Behold the Monkey) in the blogosphere. Now the painting was not a masterpiece by any means, and the artist was barely known except in this small Spanish town. But still, the story is so horrifying from an art historical standpoint that if we didn't laugh, we'd have to cry. But let's take a moment to consider this issue seriously, especially as it relates to liturgical art. The obvious question that this raises is: who is qualified to make art for the church? I'm not trying to be an elitist. I think that art is wonderfully democratic in the sense that everyone can view and appreciate it—but not in the sense that anyone can make sacred art. So if you're asking yourself what American Idol could possibly have to do with liturgical art, here it is. The American Idol phenomenon has sparked dozens of spinoff talent competitions and reality shows, all of which seem to have the effect of fueling the belief that anyone can be a millionaire pop star. When my wife Emily taught voice lessons in Savannah, she had at least a dozen teenagers who were taking lessons to prepare for Idol tryouts, or to start their pop music careers. One 23-year-old with no musical experience whatsoever apparently thought that she could take piano and voice lessons for a month or two and then play and sing at a professional level. When my wife informed her that this was probably not a realistic goal, she asked, "Well, how long do you think Alicia Keys has been playing piano?" Emily answered, "Probably her whole life." The disappointment was palpable. The student's dreams hit the floor like a wet sandbag. While I don't think American Idol had any effect on this 81-year-old woman's attempt to restore a damaged fresco of Christ, I can't help but feel that Idol (and shows like it) have contributed to a feeling that talent is irrelevant, and that all that is necessary is the will to act. That's the American dream, right? That anyone can pick up a violin or a brush or a microphone and become the next big hit? Well, here's one opinion to the contrary, and I think Miss Gímenez is exhibit A. However well-intentioned she might have been, and however well we appreciate love, determination, and the will to act, an ear cannot will itself to be a hand. This brings us to the doctrine of vocation. 1 Cor. 12:12-17 explains that the Christian Church is the body of Christ—one unit with many different parts. We celebrate our variety in Christ. We are not all pastors, teachers, musicians, or artists. We are not all contractors, homemakers, engineers, or administrators. Each of us has a calling that is specific to only himself or herself, and for which God has bestowed talents upon each individual. St. Paul addresses the necessity of each part, as well as the attitude of each part to another. But God has combined the members of the body and has given greater honor to the parts that lacked it, so that there should be no division in the body, but that its parts should have equal concern for each other. If one part suffers, every part suffers with it; if one part is honored, every part rejoices with it (1 Cor. 12:24-26). I don't think anyone should feel guilty in saying, "I thank you for your earnest desire to help, but this doesn't appear to be your calling," as long as it is done with love and not with condescension. Perhaps we can encourage these people to rally support for whatever job it is they feel needs to be filled. Being a "helper" is certainly a fine vocation in itself (Gen. 2:18). You will probably say that some churches are too small to have talented artists, musicians, etc. contributing to worship. This is true. But we are not islands existing apart from the other members of Christ. If a church really values the vocations that it is missing, it can find the means to obtain them. Where is it written that if a church wants artwork, it has to be provided by a member of the congregation? Or that it has to have a choir, even if there is no one qualified to lead it? I think reexamining our assumptions about ecclesiastical artwork in light of the doctrine of vocation should make us embarrassed of the way we have treated the talented members of our fellowship in past decades. Holy Spirit, help each of us to build up the body of Christ! Amen.